Stocks charged higher again on Friday and all four of the main indices gained ground. The Dow led the way with a gain of 1.03% as it got a big lift from Disney, Dow Chemical, and JP Morgan. The S&P was up 0.66% and that was good enough for second while the Nasdaq gained 0.46% for the third best performance. The Russell lagged the other three, but still tacked on 0.36%. Nine of the 10 main sectors moved higher on the day with the healthcare sector losing 0.92% as the only one in the red. The consumer staples sector was the second worst performer, but it gained 0.25%. On the plus side, the financial sector gained 1.84% as the top performer. The industrial sector and the materials sector tied for the second best performance with each one gaining 1.32% on the day. My scans were dead even on Friday with 14 names on each list. This ended a string of eight straight negative readings from the scans. The barometer jumped from -50.1 to -30.4 once the results from Friday were added in to the equation. Today’s trade idea comes from the bullish list and it is on Welltower (NYSE: WELL). The healthcare REIT scores a 91 on the EPS rating system, but the SMR rating is average with a C. The company will report earnings on April 30, so you will want to be aware of that date. 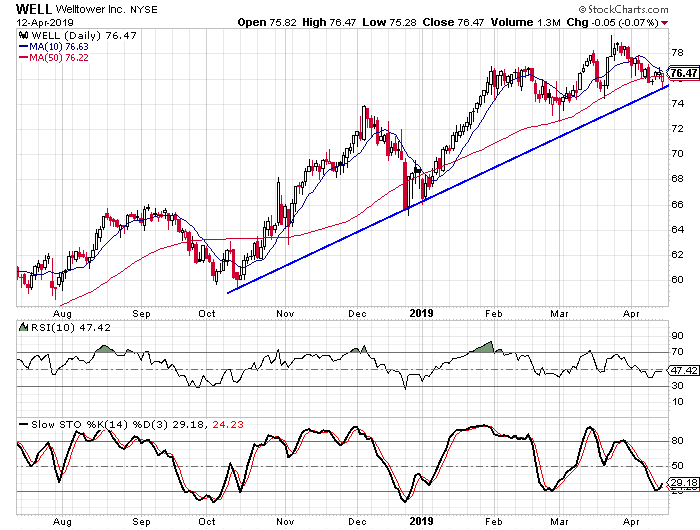 You can see on the chart how Welltower has been trending higher since October with that low connecting with the lows from December and January to form a trend line. The stock hit the trend line on Friday before bouncing back. We see that the stochastic readings were close to oversold territory before making a bullish crossover on Friday. Buy to open the June $75-strike calls on WELL at $2.85 or better. These options expire on June 21. In order for these options to double the stock will need to reach $80.70 and that is only 5.5% higher than where the stock closed on Friday. I suggest a target gain of 100% with a stop at $74.80.